Blog Protecting Your Investment	What’s Bugging Your Rain Gutters? What’s Bugging Your Rain Gutters? Most homeowners experience common issues when it comes to rain gutters. Gutters can overflow during rainstorms. Downspouts can become clogged and cause water to back up into the gutters. Heavy rains in the spring can sweep pine needles, twigs, and other spring debris from your roof down into your gutters. Leaky gutters can cause rot to fascia, and even to your walls if it gets behind your siding or comes in through your windows. But there could be other problems lurking in your gutters that you may not even be aware of. One of the most common pests to make their home in rain gutters are mosquitoes. Mosquitoes need water to reproduce, and they can lay their eggs in even a small area of standing water. Improper downspout draining, bird baths, outdoor tarps, and old tires are all areas where water pools and mosquitoes love. Your gutters can also create a perfect environment for a mosquito nursery. If your gutters aren’t free from debris, small pools of water can collect in the gutter trough. Improperly angled gutters won’t completely drain during a storm, again creating standing water. Bees and wasps can also take up residence in your gutters. They can be a problem even if (or especially if) your gutters are clean and free flowing, because that creates a nice dry environment to build their nest or hive. Getting rid of bees in your rain gutters can be tricky and dangerous – if you’re up on a ladder and are swarmed by angry bees you risk a dangerous fall. It’s usually a good idea to call in a professional pest control company to rid your gutters of bees or wasps. If you do decide to tackle this yourself, do it in the evening when the bees are in their nests and not active. Bees are beneficial to your landscape because they’re pollinators, so if the nest is behind an upper downspout or in an area where there isn’t much foot traffic, consider leaving them there. 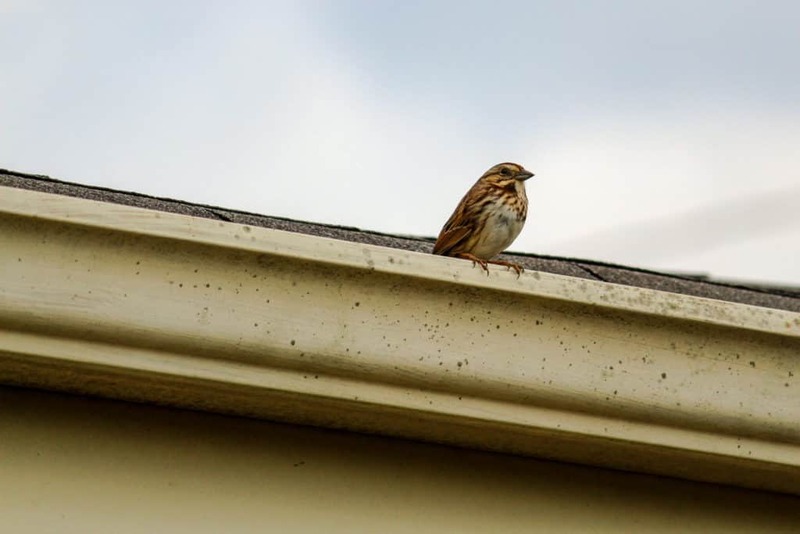 Birds are another wildlife creature that can take up residence in your rain gutters or behind a horizontal bend in the upper downspout. You’ll want to remove the nest as soon as you see it being built. Most people aren’t aware of this, but the Migratory Bird Treaty Act makes it illegal in the United States to disturb the active nest any native bird without a permit, and you can be subject to hefty fines if you do. Note this does not apply to not-yet-completed nests or to any non-native bird species. Some of the most common non-native species are the house sparrow, European starling, rock dove, and Canada goose. Many of our small native birds, like Carolina Wrens and house finches, only incubate their eggs for about two weeks before they hatch, and the babies need another two more weeks before they fly out on their own. As long as it’s not creating a major problem for your gutters or downspouts, consider leaving the nest alone. Once they’re gone, remove the nest and clean the area with a disinfectant spray. 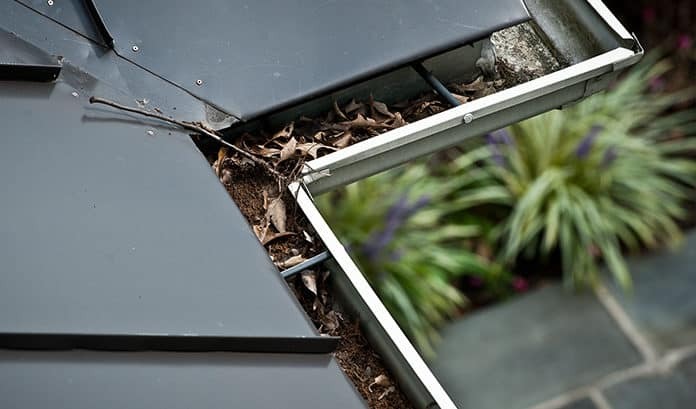 If your gutters are severely neglected and full of tree debris, that debris can eventually break down into rich soil. When trees begin to drop their flowers and seeds in the springtime and the wind blows around weed seeds, you could actually have a gutter garden begin to grow. Decomposing debris gives seeds the perfect spot to germinate. If you have a gutter garden, your gutters are way past due for a good and thorough cleaning. Rain gutters and downspouts that become clogged and don’t drain properly can cause all sorts of problems and bring all sorts of uninvited guests to your home. Keeping gutters clean and free-flowing can help deter pests from seeking shelter in your rain gutters. If you do have to remove the pests, keep in mind that any chemicals or pest sprays you use will drain down into storm drains and find their way to the Bay. Consider the environment when choosing to use any chemical sprays. And if you’re at all hesitant about cleaning gutter debris or removing the pests, call in a professional.